There's nothing worse than running late for a flight. 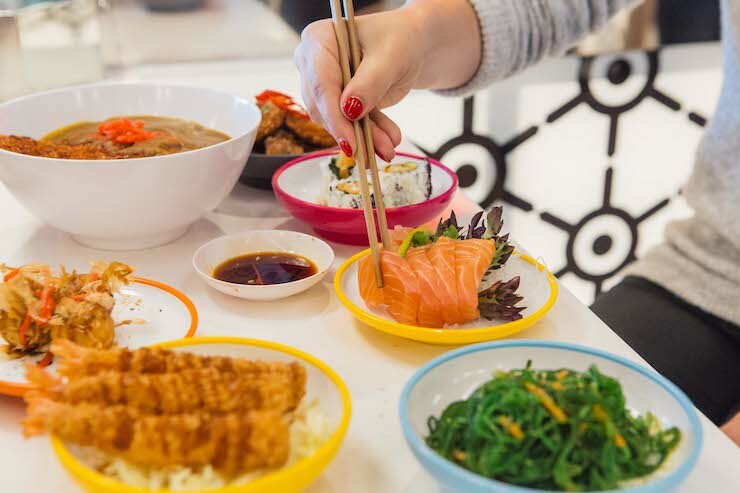 Not only do you potentially miss your flight (read: ruin your holiday, duh), you also risk missing out on all the best tax free shopping deals, and the food, glorious food. To make sure you're never late to the airport again, we've teamed up with Sydney Airport to bring you every delicious reason you could ever need to arrive early. BYO stretchy pants, obvs. LBH, McDonalds is never a bad idea. But trust us when we say, the new McDonald’s at Sydney Airport's T1 International is legit one of the best ideas you’ll ever have. Whether you order a Happy Meal or a Big Mac, your food will be prepared up in their sky high (see through) kitchen and delivered via a burger carousel. The calories are worth it for the novelty alone. 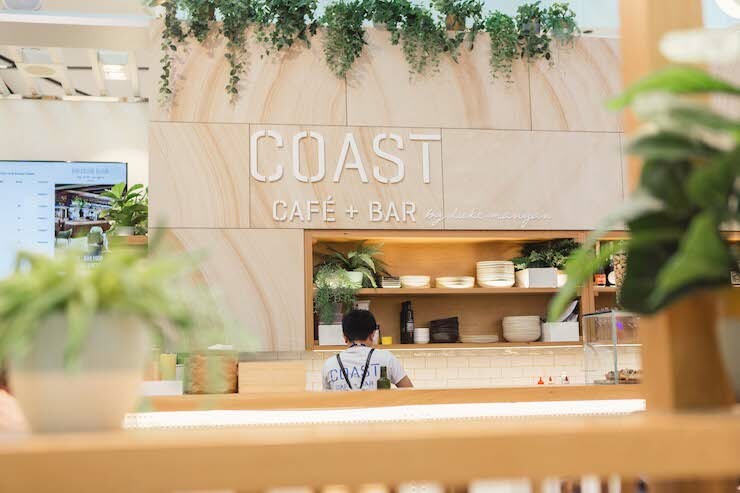 We know what you’re thinking and yes, really—you can tuck into authentic pork belly bao at Sydney Airport T1 courtesy of Luke Mangan's epic Coast Cafe and Bar and we can also confirm they’re delish, too. Think melt-in-your-mouth pork belly wrapped in fresh to death bao bun with lashings of hoisin sauce, cucumber, coriander and spring onions #droooool. You’re not truly on vacay until you’ve passed through security, shopped up a storm at duty free, and snapped the ultimate pre-flight Insta pic at Heineken House. Arrive early, treat yo’self to an ice cold frothy (or a bottle of bubbles) and mock all the people rushing to their gate. Go on, you deserve it. The last thing you want to be when you get on a long haul flight is hangry. Lucky for you (and us), the team at The Bistro by Wolfgang Puck know this and have come up with the perfect solution: prawn pasta with chilli and white wine (our fave!). Simple but oh-so tasty, top with a healthy dose of salt and pepper and let the carb loading begin! Crumpets are totally underrated. What more could you want than homemade English hot cakes drenched in Pepe Saya butter and a bucket load of honey? Nothing. That’s what. FYI you can find them at Kitchen by Mike and Kitchen by Mike Express. Curry might not be your typical pre-flight go-to, but there’s something about Japanese fried chicken curry that we can’t resist. Whipped up by the guys at YO! Sushi, the chicken is crispy AF and the curry sauce is silky smooth. In other words, it's pure perfection. Vegetarians unite! Our mate Luke Mangan is serving up the falafel burger of your dreams at Bridge Bar and it’s almost worth booking a flight just so you can try it. Complete with hummus AND tzatziki, it’s the kinda thing you wish you could make at home but can’t (#sorrynotsorry). There’s nothing like a ginormous slice of banana bread and you can actually taste the banana. We could eat it for breakfast, lunch or dinner, and do at Luxe Bakery. If prosciutto, mortadella, salami and bresaola don’t sound like a good time to you, we don’t know what does. Do yourself a favour and keep your belly happy with the salumi plate (feat. all of the above) from T1’s Mach2, made better when paired with a Negroni, naturally. 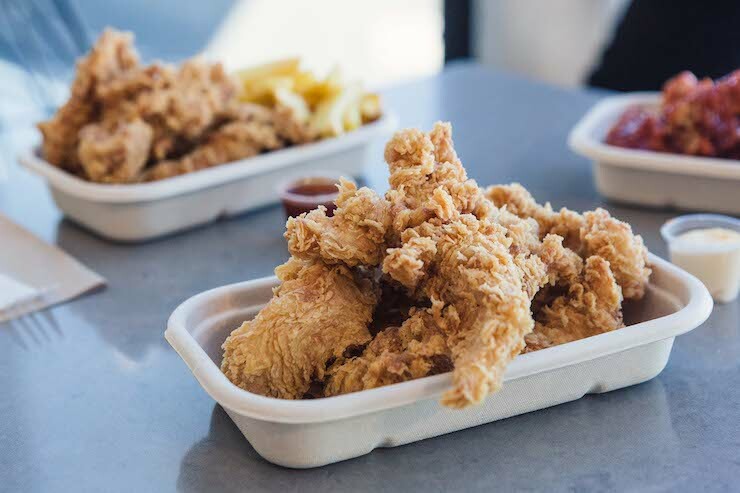 The only KFC we like is Korean (not Kentucky, sorry Colonel!). BBQ Chicken serve up the ideal amount of greasy (in a good way) chicken that’s sure to get you finger-lickin’. Don’t forget the hot sauce! If you prefer Japanese fried chicken, see #7. Guys and girls, if there’s one thing you need pre-flight it’s coffee and Campos Coffee deliver the goods. Strong and smooth (just the way we like it), skip your local and grab your caffeine hit on the ground. Editor’s note: This article is sponsored by Sydney Airport and proudly endorsed by The Urban List. Thank you for supporting the sponsors who make The Urban List possible. Click here for more information on our editorial policy.